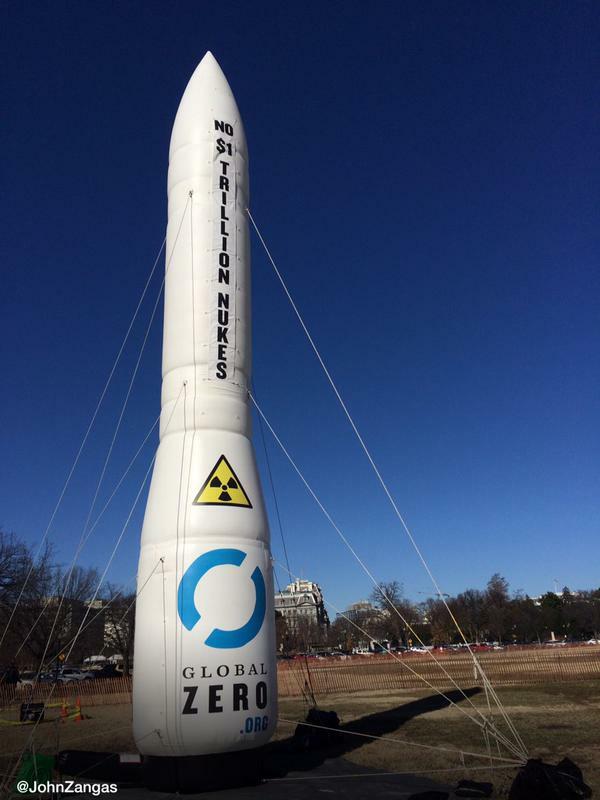 On the 31st of January, activists erected a mock ICBM missile in the Ellipse in opposition to US plans to spend $1 trillion on new nuclear weapons. Under the name "Global Zero" they called instead for the global decommissioning of nuclear weapons. Many of these weapons are decades old, some may not function if an attempt is made to use them, and they are a growing hazard for a release of nuclear waste. Spring-Break-March Delegation to Venezuela: The Revolution Continues! While the mainstream media speculates about the future of the Bolivarian Revolution since the passing of Hugo Chavez, for the Venezuelan popular sectors, there is no turning back to a state of marginalization and exclusion. Come learn about the process currently transpiring in Venezuela as the people, faithful to the legacy of Chavez, deepen and further radicalize their struggle in defense of the Bolivarian Revolution. Read more about Spring-Break-March Delegation to Venezuela: The Revolution Continues! Henry Kissinger is a notorious war criminal who must watch where he travels because of arrest warrants abroad. On the 29th of January, he found that citizen's arrest is also a danger. 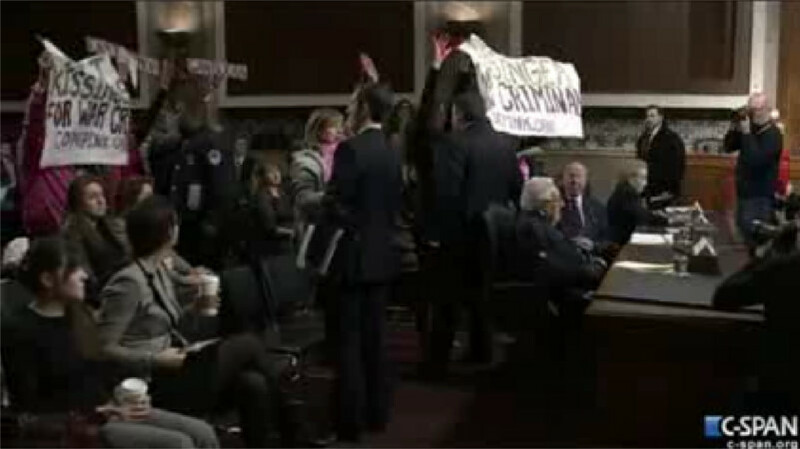 He showed up to speak before the Senate Armed Services Committee, only to find Code Pink was waiting for him. Considerable disruption ensued as the banners came up and Code Pink attempted to serve those international warrants via a citizen's arrest. The Shortwave Report 01/30/15 Listen Globally! Read more about The Shortwave Report 01/30/15 Listen Globally! While the NPS has finished killing deer in Rock Creek Park for the seasion, the Maryland National Capitol Park Police have started shooting deer themselves on the MD side of the state line. On Jan 28, activists tracked the man putting out corn bait to one exact site where deer are being shot. 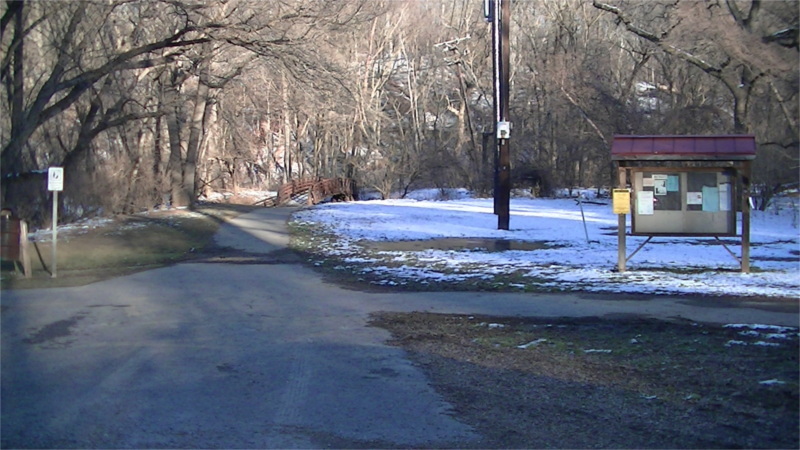 Entry to the area on the side of Rock Creek Park oppposite from Jones Mill Road on the creek itself. 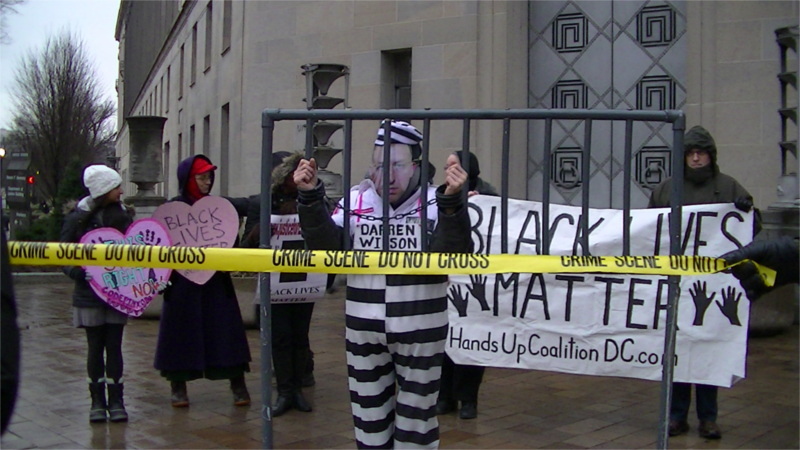 On the 26th of January, the weekly Monday vigil for those murdered by police featured Code Pink staging a mock arrest of Darren Wilson while speakers condemned the so-called Dept of Justice for refusing to recommend civil rights charges be filed against him. Darren Wilson is the killer cop who gunned down Michael Brown in Ferguson. Now he is among the world's most wanted fugitives, he can't even go to 7-11 to buy a pack of skittles without fearing arrest not by the government but by the people. On the 26th of January, mainstream media outlets reported that a hobbyist drone crashed somewhere on the White House grounds and was "self reported" by the hobbyist. The White House, of course is where all the orders come from for much larger CIA drones to bomb and kill people all over the world, yet they are whining about this tiny, unarmed hobbyist drone. 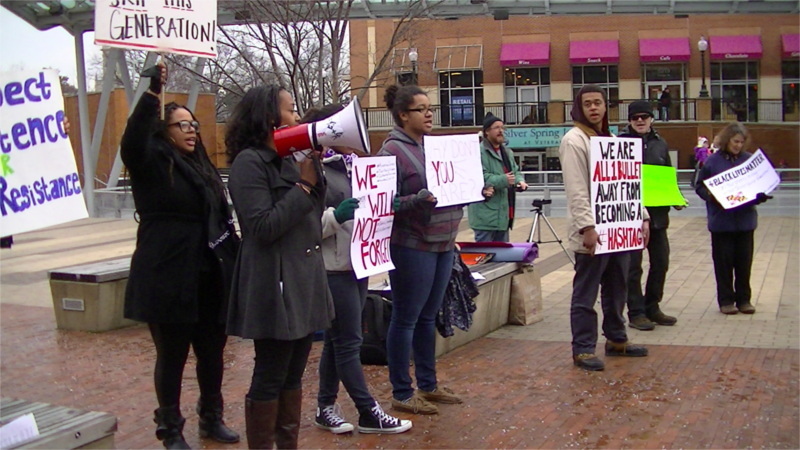 On the 24th of January, civil rights protesters showed up in Silver Spring, MD next to the outdoor skating rink by the Civic Center. Although this small group was entirely peaceful, heavily armored Montgomery County cops and three cop cars lurked about a block back watching. The music at the skating rink was gradually turned up in an attempt to override the rally speakers and their megaphone. The rally was very visible to all those using the skating rink, and educational in an unexpected place. It was followed by a short march through downtown Silver Spring. 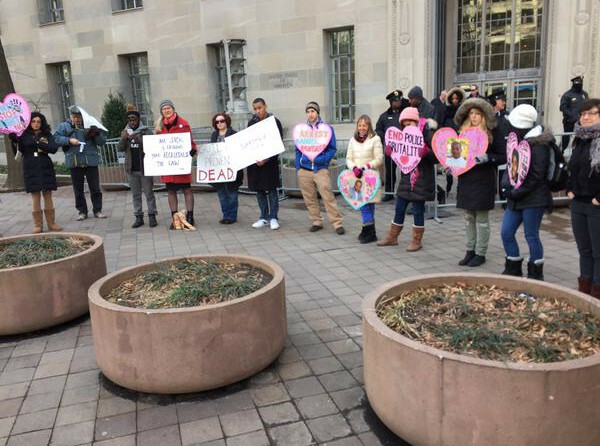 On the 22nd of January, civil rights activists showed up outside the Dept of Justice to deliver over 150 poems to the dept of Justice. All were on the theme that Black Lives Matter. Also included was a list of demands. The Shortwave Report 01/23/15 Listen Globally! Read more about The Shortwave Report 01/23/15 Listen Globally! On the 21st of January, civil rights protesters showed up outside the National Mayor’s Winter Meeting at the Capitol Hilton. They were demanding accountability for killer cops and police brutality. DC cops arrested an activist they deemed an organizer as protesters confronted Philadelphia's police commissioner outside the hotel. This was after activists asked how he liked being on the receiving end of a jump-out. The 21st of January, 2015 marked the 5th anniversary of the Supreme Court's notorious Citizens United case, which legalized unlimited corporate campaign cash in US poltiics. Protesters showed up in multiple locations. Five people were arrested disrupting the Supreme Court's opening day of the year for yelling "One person, one vote" according to NBC News. 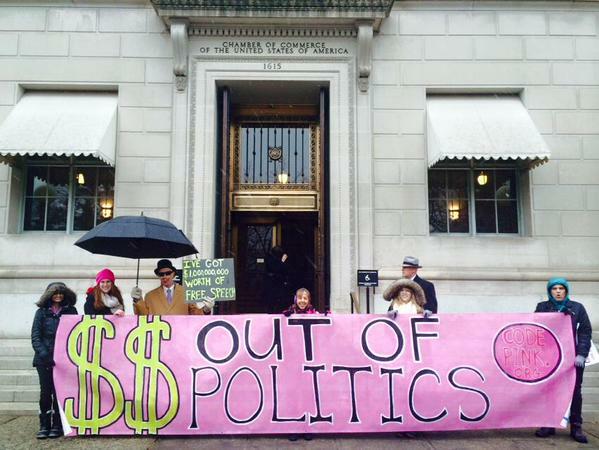 Public Citizen staged a substantial rally at the White House, and Code Pink showed up in front of the US Chamber of Commerce, which represents some of the major beneficiaries of Citizen's United.